A skydiver in Peru is lucky to be alive after he got caught on the plane while trying to jump out. Fernando Gava’s jumpsuit got stuck to the plane’s step according to Maurice Mathey, a friend who recorded the frightening footage. Gava dangled precariously upside down for about 30 minutes while the plane circled at an altitude of about 10,000 feet. Finally, Gava used a knife to cut himself loose. Once he was free of the plane, he released his parachute without incident. His only injury was a cut to his hand from the knife. is he praying before jumping? 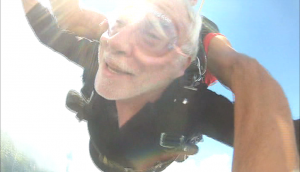 I don’t usually acknowledge birthdays — but yesterday I decided to commemorate the day by jumping from a perfectly good plane at 10,000 feet — with the added handicap of an almost perfect stranger strapped to my back! After filling out the paperwork, they advised me that anything could happen — including “injury or death” — with no legal recourse on my part. I was then asked to view a video where the developer of the Tandem system vowed that no system, no equipment, no instructor is perfect. 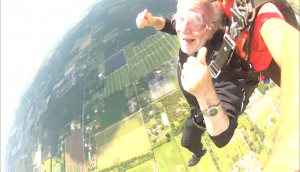 Here’s are some stills from my Leap of Faith — not easy for an avowed Atheist! And here is the video . When I was in the army, I jumped five times to earn my wings. But these were combat style from just 1200 feet and attached to a clothesline. My brother made 66 jumps between military and civilian. But his highest freefall was a “mere” 6500 feet. And that is why in our little group, Joe is the recordholder and champion! You are currently browsing the archives for the parachuting category.